Our students have participated in many learning opportunities. Learning abroad trips to France, Quebec, and Belgium. Visit to local art studio to learn about Latin American Painters. Visit local Mexican restaurants. Los Angeles City Hall and Olvera Street. French Film festival at the Director’s Guild theater. Exchange students programs hosting students from France and Germany. Biliteracy Seal in French and Spanish. German lantern festival. World Languages Department Soccer Tournament. International Week: a celebration of cultures around the world. French and German Week. German class trip to a local museum including catered German lunch. Spanish Tapas Parties. Spanish Cooking Show. Viva Flamenco: Dancing Fridays. Karaoke Days. The Academy of World Languages and Culture at Santa Susana offers students the opportunity to study Spanish, French, and German. 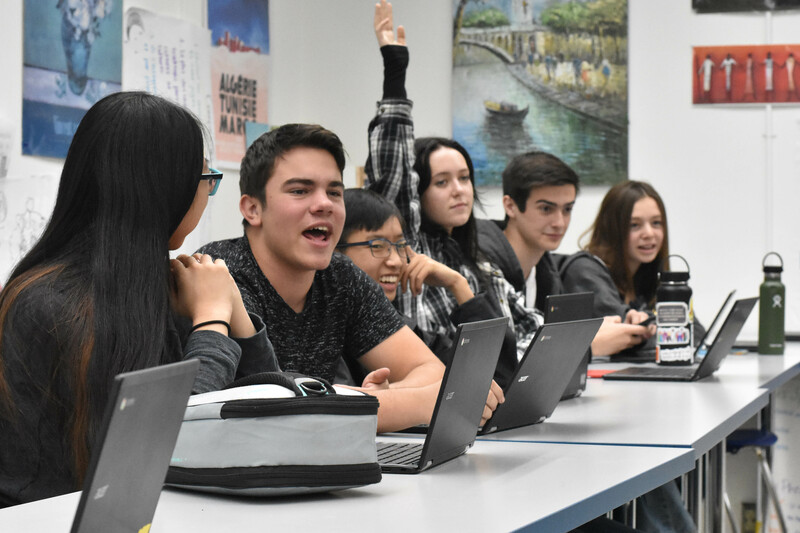 The Academy of World Languages and Cultures at Santa Susana High School offers its students the opportunity to study and explore the languages of Spanish-, French-, and German-countries around the world. More importantly, they're invited to participate in field trips to museums, film festivals, and restaurants on the local level as well as in study trips abroad. In addition, students can host exchange students while attending SSHS. After four years of language studies, the students are eligible to apply for the California Seal of Biliteracy on their high school diploma, certifying the attainment of a high level of proficiency in two or more languages. This program is a developmental study in all phases of second language acquisition touching up the six AP Language themes. It contains within it repetition and recurrence of previous learning, blended with the six themes. As the program progresses, an emphasis upon the productive skills (writing and speaking) are highlighted. The course is designed to extend the learning of the first three years and prepare the student for the AP exam. Level III is a developmental study in all phases of second language acquisition. It contains within it repetition and recurrence of previous learning, blended with new materials. As the program progresses, the course is designed to extend the learning of the first two years, and to prepare the student for either Language III Honors or Advanced Placement.Completion with a “C” or better of a Level III Foreign Language course meets the recommended preparation in language for acceptance to the UC system and most private colleges and universities.Satisfies UC/CSU entry requirements.PREREQUITE(S): Successful completion of Level I and Level II. LEvel II must be completed with a “C” and the recommendation of the prior year’s teacher. All second-year language classes begin with a review and exposure of first-year material. Throughout the second year, students will develop and expand their foundation of vocabulary language structures and cultural awareness. Through listening and reading activities, students will acquire a greater understanding of the language. Additionally, through speaking and writing activities students will be able to communicate more naturally in the target language. Students expand upon the course content from Level I.Completion with a “C” or better of a Level II Foreign Language course meets the entrance requirements for the CSU system and is the minimum expectation for acceptance to the UC System and most private colleges and Universities.Satisfies UC/CSU entry requirements.Prerequisite(s): Grade of “C” or better in Level I course. In all Level 1 classes, the goad is basic, everyday communication and cultural awareness. Students will develop a solid foundation of vocabulary and language structure in listening, speaking, reading, and writing. This course provides an opportunity for students to work individually or in small groups in a variety of subjects and with peers who have specific instructional needs. Students are assigned to work with a specific teacher (in this case, a World Language teacher). Good attendance, periodic meetings and log sheets detailing learning experiences are required. This course may be used as a Practical Arts requirement. Distinction between recognition, honors, and high honors is designated by GPA and level of rigor of coursework.